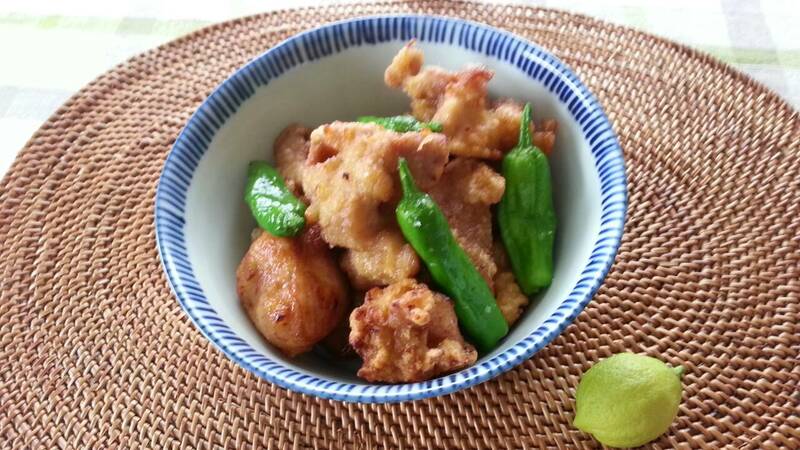 Tori-no-Kara-age is one of the most popular Japanese dishes. Tori means chicken in Japanese. You can substitute turkey for chicken. ※ If you don’t have shio lemon use 1tbsp of lemon juice and 1tsp of salt. ① Cut the chicken breast into a total of 10 large chunks, so that you have two per serving. Mince the shio lemon. Grate the garlic. Pierce the green peppers with a bamboo skewer to prevent them from exploding when they are deep-fried. ③ Begin heating cooking oil to 170-180℃ to deep-fry the chicken. You can test whether the proper temperature has been attained by dipping the end of a dry cooking chopstick into the oil. Once bubbles slowly form and rise from it, the temperature is right for frying. Dust each piece of chicken with katakuri flour and carefully put each into the oil. When they take on a light brown color and rise to the top, remove them from the oil. Once this is done, raise the temperature of the oil to 180-190℃. Place the chicken pieces back into the oil. Remove them when they are well browned and crispy on the outside. ④ Deep-fry the green peppers for just a few seconds, remove, and salt. Serve these together with the chicken.